Here are the lucky winners chosen using random.org (click on the images to view the draw and timestamp). I will notify both by email and they have 72 hours to contact me before another winner is chosen. Thanks so much to everyone who commented. Keep up the comments -- make sure to comment on the National Library Week giveaways this week! 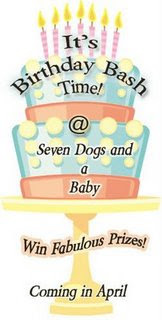 By the way, I love blog parties and Seven Dogs and a Baby is hosting a HUGE Birthday Giveaway. Little Conner is celebrating his birthday with some sweet giveaways. He really knows how to party with a Scavenger Hunt and Door Prizes. Go ahead and send him your wishes and enter to win. Conner, my two kids would love to party with you! They want directions to the bounce house for a hopping good time. I am so excited for the birthday bash! I follow your blog and seven dogs and a baby. Can't wait! I love this Birthday Bash! It is really fun. What a great Birthday! I'm having tons of fun entering and playing the ISpy! I love seven dogs and a baby. Great birthday bash! Yay for parties & Connor's b-day!